Sonia mentioned the other day that she’d love it if we ate more potatoes. 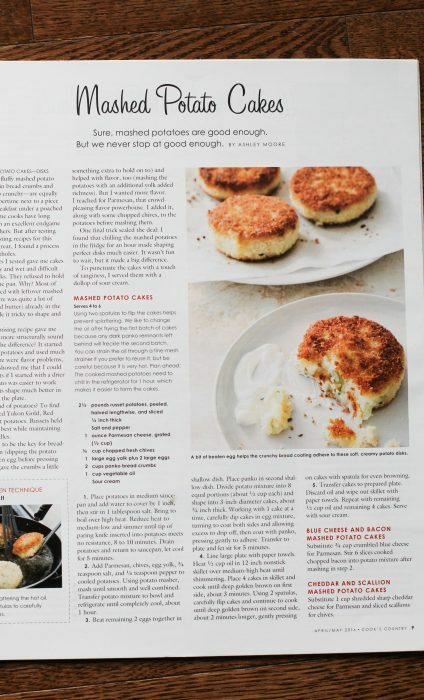 So, when I was perusing thru my stack of Cook’s Country magazines, this recipe caught my eye. Basically, you make a pared-down mashed potato recipe, chill it, shape it into cakes, coat them in panko crumbs, and then pan-fry them. And you eat the finished product with sour cream. So good! This is certainly more work than mashed potatoes, but on the other hand, I do like the fact that you can do a lot of the work ahead of time and then just dip and fry them at the last minute. And my family agreed that the crispy panko coating was quite delicious. Plus, this looks quite fancy, and it’s a fun way to switch things up with that most frugal of vegetables, the humble potato. I saw that there’s a bacon variation, which I am so going to try in the future. Bacon and potatoes are such a good combo. As is bacon and almost anything, let’s be honest. Place potatoes in a saucepan, cover with water one inch higher than potatoes, add 1 tablespoon salt, and stir to combine. Bring to boil over high heat; reduce to medium low and simmer until potatoes are tender enough to mash, 8-10 minutes. Drain potatoes; return them to the saucepan; let cool for a few minutes. Add Parmesan, chives, egg yolk, 3/4 teaspoon salt (I did not, as my potatoes were already pretty salty), and 1/4 teaspoon pepper. Using a potato masher, mash until smooth. Transfer potatoes to a bowl; cover and refrigerate until cool, about an hour. Beat two whole eggs together in a bowl or pie plate. Place panko in pie plate or other shallow dish. Divide potatoes into eight portions, then form each portion into a cake about 3/4 inch thick. 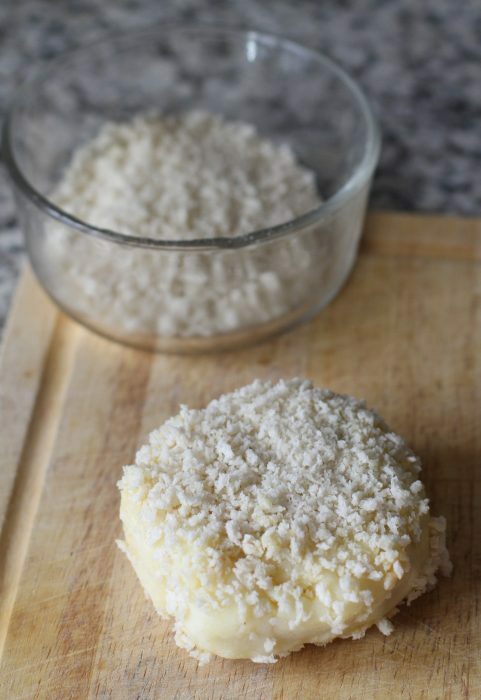 Dip cakes into egg mixture and then into panko mixture, one at a time. Gently press on the panko to make sure it sticks to the cake. Place breaded cakes onto a plate. Line large plate with paper towels (for draining the cakes). Heat 1/2 cup oil in a large skillet and heat over medium high heat until the oil shimmers. Place four cakes in the skillet and cook 3-4 minutes, or until the panko is deep golden brown. Use two spatulas to gently flip the cakes to the other side, and cook until that side is deep golden brown, about 3-4 minutes. Transfer cooked cakes to the paper towel-lined plate, and repeat cooking process with remaining cakes. Serve with sour cream. I enjoy your recipe reviews. We have made a few here that have become staple meals. The first recipe my kids learn to make is the apple pancake (the German one, can’t remember the actual name). When my daughter was 3 she would go to the kitchen and get out all the ingredients before we were even out of bed. That looks absolutely delicious! I like using potatoes as an ingredient since it’s cheap and nutritious. My parents usually make pork bone soup and throw in some potatoes and carrots. It’s tasty and healthy! I love your recipe too! I saw this preview on Facebook and let out an audible “Oooohhh! 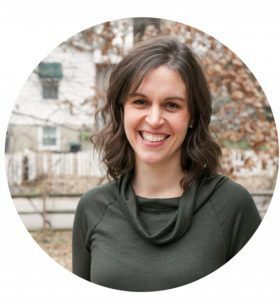 !” Thanks for sharing this! Like I needed another excuse to eat more potatoes. Potato cakes was something that my Grandma made often for breakfast from leftover mashed potatoes from the day before. Hers were a bit more simple, but I think it was a depression era recipe to reuse leftovers. It’s a nice memory to dwell on as we approach Christmas. Thanks for that. I was thinking this is perfect for those holiday leftover mashed potatoes…even if you made the potatoes slightly different, the panko crumbs would totally make this yummy!! We always make them with leftover mashed potatoes also…just add a little flour/egg/seasoning to them and fry them. Oh yes! I’ve been making and eating them for 60 years! My family must have been frugal- leftovers mashed potatoes became fried potato cakes. Yes, my grandmother used to make these for breakfast because they didn’t keep well without refrigeration back in the day. Kind of a variation on potato pancakes. Where I grew up nobody would make mashed potatoes just to make potato cakes. 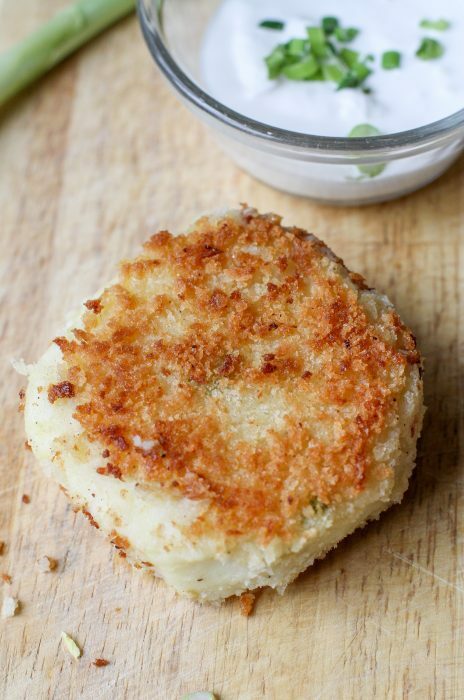 Potato cakes were always made from leftover mashed potatoes! I think the tradition goes back many generations. I haven’t had them in a few years so maybe it is time to make some – from leftovers of course! My mother always made these with leftovers mashed potatoes, but without the breadcrumbs. Sounds delicious! Oooh, I love mashed potato cakes! I make them pretty frequently, sometimes with crumbled bacon, sometimes not. Garlic mashed potato cakes are also good. It is such an easy recipe to come up with variations and tweak according to your family’s taste. I grew up eating these… they’re considered “farm food”. Haha. But it’s even easier than the recipe makes it… take leftover mashed potatoes, form patties and just put in a skillet with a little heated oil of your choice, flip after a few minutes and done. We eat them with bbq sauce. If she’s into potatoes, have you tried making hash from a leftover roast/London broil? We prepared them the same way but it was either applesauce or sour cream on the side. My mom always made potato cakes if we had leftover mashed potatoes. She would add diced onion and an egg, simple but so yummy! Yum, I love croquettes! I make something similar using leftover mashed potatoes and pot roast stirred together, then breaded and fried the same way. It’s a good way to use up the last couple of servings of pot roast, when we’re not as excited about the leftovers. 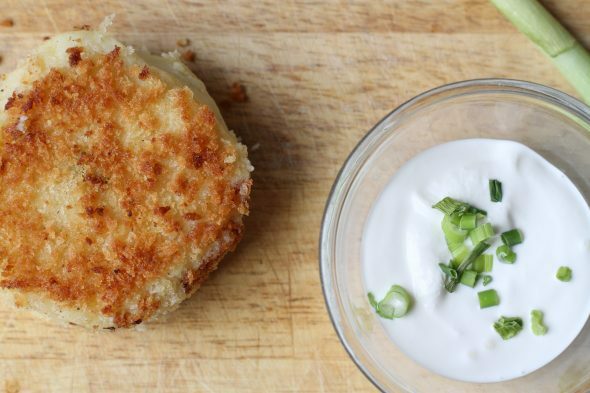 Like others I grew up eating “potato cakes” from leftover mashed potatoes. Depending on how much was left we would add one or two eggs and mush it all up well. Mama coated them lightly in flour and cooked them gently in sizzling butter in a skillet. I used to beg her to put aside mashed potatoes before we ate, just to be sure we had enough left over the next day. My kids love them too. For my new recipe I made my first stock from as much leftover veggies as I had bones, and I combined chicken and turkey bones in it. It turned out surprisingly well. One of my other favorites, Sam the Cooking Guy, did a take on potato cakes using Thanksgiving leftovers…mashed taters, stuffing, turkey, etc….and they sounded delicious, just like yours. I appreciate that his recipes and approach to cooking are, like yours, so accessible. Plus he makes a lot of Asian and Mexi dishes. Keep the recipes coming!! P.s. the language in his videos can be a bit salty, but his recipes are solid. Yes, an oldie but definitely a goody! Thanks for the reminder! My father in law is always asking us to make “mashed potato pancakes” and I’ve never found a satisfactory recipe. Admittedly, I’ve only tried two. Anyway, I’m saving this to try with the Christmas dinner leftovers! This reminds me of an Ina Garten recipe with risotto and cheese. Oh man…I’m going to have to try this just because I love that recipe so much. I’d definitely add chives and bacon to mine. Yum! I grew up eating these from leftovers too, but will definitely have to add the Panko to update them. It’s been ages since we’ve had some. Can you describe your process of using two spatulas to flip them? I’m having a hard time visualizing that, but I always have trouble with patties falling apart, so would like to learn your technique. I’m not surprised they were delicious – they look good and the idea is a classic. Me, if I were making this for my main dish, I would add minced meat to the taters, to up the protein. I made an improvised version of this recipe tonight with some leftover mashed sweet potatoes. Rave reviews from all! My 15-y-o son had 2 friends over for dinner & they were all in heaven. Served with turkey kielbasa & toasted broccoli, and all was well. Thanks; this is definitely going into the rotation. These look yum I’m gonna given them a go – we keep finely grated parmesan in the freezer in a container ready to spoon out. Another idea Sonia may like is potato rosti. Parboil the potatoes (I do 10 min) then drain & refrigerate until cold. Grate the cold potato then fry gently adding salt & pepper to taste stirring & flipping for a couple of minutes in a tbps olive oil with a blob of butter then shape into a disk & press & flatten a bit together, cook until golden on the bottom then place a plate over the top, gently flip over on to the plate then with a large spatula slide back into the pan to brown the other side. Cut into wedges to serve.